The Danish Ambassador in Prague, Ole Moesby, has decided to walk the walk to back up talkin' the talk on the environment. 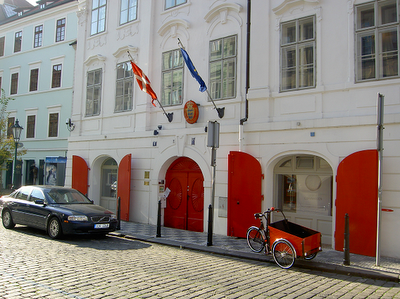 The Danish Embassy in the Czech capital has just purchased a Christiania cargo bike for the ambassador to use on offical business in the city, complete with Danish flag. So if you see an elegant looking man on a rolling Danish icon in Prague, you know who it is. The Czech press seem to get a kick out of the story. Copenhagenize is happy to have played a modest role. I was lecturing in Pardubice earlier this year - Czech Republic's leading bicycle town with 18% trips by bike. The ambassador was present and he gave me a lift back to Prague. I told him that Christiania bikes are made in Czech Republic - he wasn't aware of this - and I put the Embassy in touch with Christiania bikes. In no time, the ambassador got a new ride.